Planned, according to tradition, by the Rev. Peter Richard, pastor who came from Loire, France, 1868. First (1847-51) resident pastor, the Most Rev. 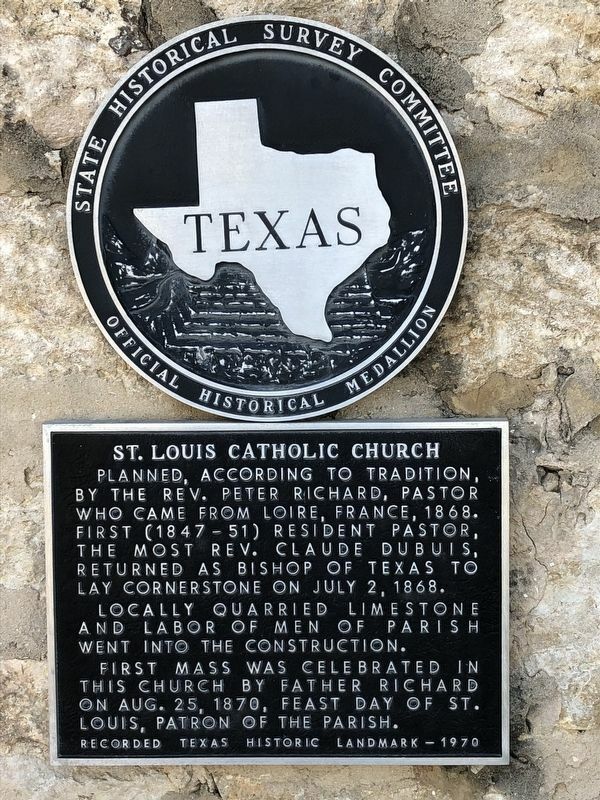 Claude Dubuis, returned as Bishop of Texas to lay cornerstone on July 2, 1868. Locally quarried limestone and labor of men of parish went into the construction. First Mass was celebrated in this church by Father Richard on Aug. 25, 1870, feast day of St. Louis, patron of the parish. Location. 29° 21.351′ N, 98° 52.771′ W. Marker is in Castroville, Texas, in Medina County. Marker is at the intersection of Angelo Street and Paris Street, on the right when traveling south on Angelo Street. Touch for map. Marker is at or near this postal address: 1306 Angelo Street, Castroville TX 78009, United States of America. Touch for directions. 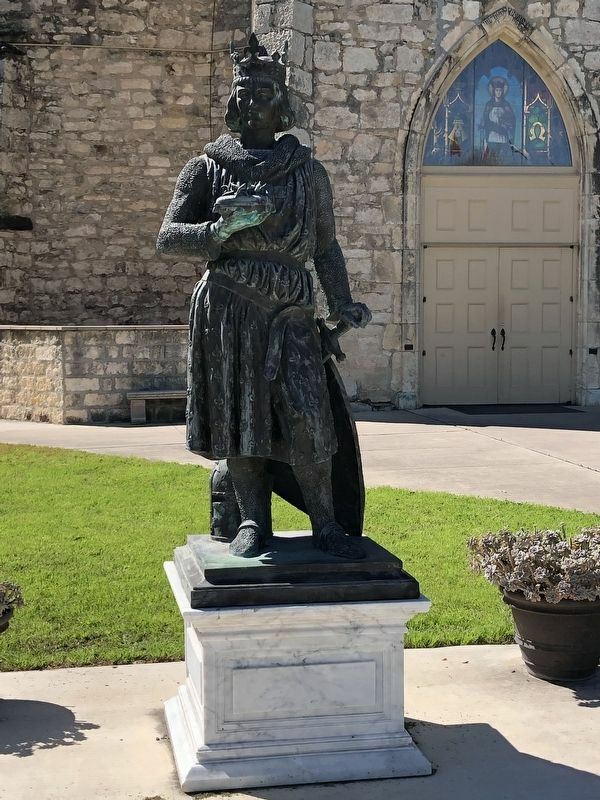 shouting distance of this marker); Alsatians of Texas (within shouting distance of this marker); Moye (about 600 feet away, measured in a direct line); First County Courthouse (approx. 0.2 miles away); Zion Evangelical Lutheran Church (approx. 0.2 miles away); Site of the Homestead of Henri Castro (approx. 0.2 miles away); Henri Castro (approx. ¼ mile away). Touch for a list and map of all markers in Castroville. More. Search the internet for St. Louis Catholic Church. Credits. This page was last revised on February 27, 2019. This page originally submitted on February 27, 2019, by Brian Anderson of Kingwood, Texas. This page has been viewed 33 times since then. 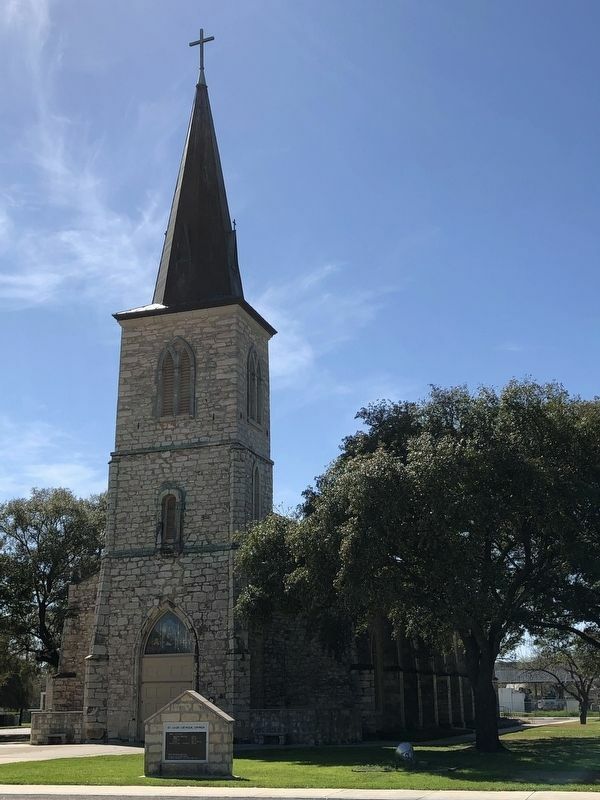 Photos: 1, 2, 3. submitted on February 27, 2019, by Brian Anderson of Kingwood, Texas.